One major concern many people ponder before pursuing a loft conversion is “will there be enough space to create the room I want?” This worry is often doubled for those who wish to turn their loft into not one — but two new rooms! It’s common for people to want an en-suite alongside a new bedroom in the loft. 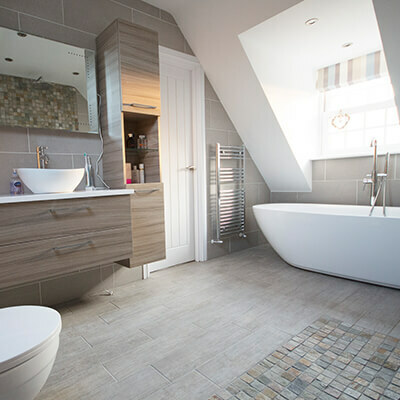 This may seem a daunting prospect to configure, but with some preparation and creativity, you can achieve a fully functional en-suite as well as a gorgeous new bedroom in your pre-existing loft space. This article is going to offer a few tips on how to do just that. We can’t stress enough how important planning will be for a project of this type. Not only do you need to ensure that there is enough available space for the ensuite features (toilet, bath, shower) in addition to the bedroom, but you also need to plan how the plumbing will work so that your en-suite receives sufficient water. We recommend situating your ensuite so that the pipes travel the shortest possible distance before reaching the rest of your house’s main piping system. Doors can also take up a lot of space. Depending on the function of your bedroom/en-suite and who will be in there, you may want to consider not having a door between the two, and creating open space instead. This will help the whole area to feel more roomy, as well as provide precious space that would have otherwise been taken up by clunky doors. If you feel that a door is a necessity, consider sliding or pocket doors that can be neatly housed in a recess. The main consideration for a project of this calibre is how to utilise the space. One great idea is to implement a wet room instead of a shower unit. A wet room simply uses a shower head that sprays onto a portion of the bathroom floor. The water is contained in the area due to the floor slightly sloping. This allows you to occupy a shower area without needing to install a bulky shower unit. Plus, wet rooms provide a unique aesthetic that you won’t find in many other bathrooms. Dormer or Velux windows are a great way to add natural light to your loft without compromising the amount of available space. If you don’t want your en-suite to feel dark and dingy, install these windows where you see fit. You may want to consider your privacy when installing windows for an en-suite, however, so a good option is to consider windows on the slope of the roof that face towards the sky. Remove the space taken up by radiators by installing an economical alternative. Underfloor heating requires no plumbing and is easy to install, unlike radiators that will need to be connected to the pipework. This option is also perfect if you opt for a wet room, as it helps to dry the floor efficiently. Here at Kingsmead Conversions, we offer personally designed loft conversions from experienced professionals. We take everything into account, perfectly measuring and planning to ensure you receive the perfect loft conversion for you. To enquire further about our services, give our team a call today.